Was Biden's Replacement Pick Made to Help His Son Get Elected? Democratic vice president-elect Joe Biden and his son Beau acknowledge the crowd during the DNC on Aug. 27, 2008, at the Pepsi Center in Denver. Delaware Gov. Ruth Ann Minner’s (D) decision to appoint Vice President-elect Joe Biden’s longtime aide Ted Kaufman to the Senate has upset local Democrats who believe the move was a ham-handed attempt to engineer the election of Biden’s son, Beau, to the Senate in 2010. By selecting Kaufman, who has said he would serve only two years before a special election is held in 2010, Minner bypassed other interested Delaware pols and ensured that Beau Biden will have a clearer opportunity to succeed his father in the Senate. Beau Biden, the state’s attorney general, is currently serving in Iraq as part of the Delaware National Guard. “There is definitely going to be some blowback,” said Delaware State political science professor Sam Hoff. 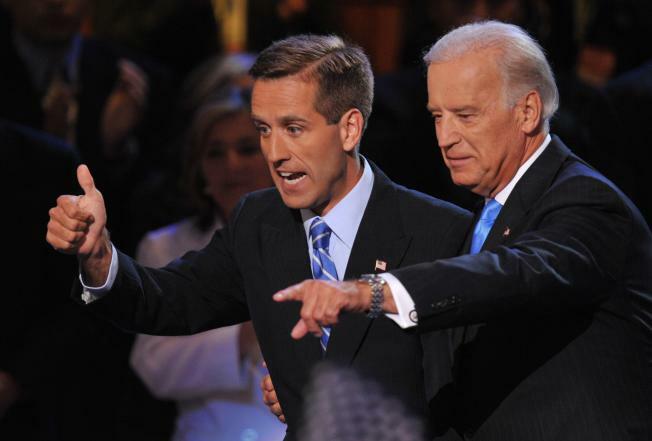 With Beau Biden in Iraq, some Democrats believed that Minner would turn to Lt. Gov. John Carney to fill the soon-to-be-vacant seat. Minner had endorsed Carney this year during his losing bid to secure the Democratic nomination to replace the term-limited governor. But if Carney had been appointed, it likely would have given him an advantage in a 2010 Democratic primary over Beau Biden, who is widely assumed to be interested in his father's Senate seat. Now, Carney will now have to challenge the perceived heir-apparent in two years, an uphill race some doubt he will want to run. Carney has not yet revealed his intentions for 2010. A state Democrat close to Carney said that after losing his gubernatorial bid “the better part of the Democratic party in the state was rooting for John” to get the appointment in the event Biden became vice president. “There is a lot of disappointment out there,” he added. Joe Biden, who will resign his Senate seat before he is sworn in as vice president in January, framed the Kaufman appointment as a move that was intended to level the playing field in 2010, not make his son the odds-on favorite. "It is no secret that I believe my son, Attorney General Beau Biden, would make a great United States Senator—just as I believe he has been a great Attorney General. But Beau has made it clear from the moment he entered public life, that any office he sought, he would earn on his own," Biden said in a statement. "If he chooses to run for the Senate in the future, he will have to run and win on his own. He wouldn’t have it any other way." Though few Delaware Democrats were willing to go on record to criticize the Kaufman appointment, there were strong suggestions that frustration with the choice runs deep. "Delaware Democratic Party Chairman John Daniello was informed neither about the press conference today, nor the appointment of Mr. Kaufman. Therefore, he suggests that all media direct their requests to Governor Minner, Vice-President-elect Biden and Mr. Kaufman until he gets an opportunity to speak to the parties involved," Delaware Democratic Party Communications Director Renee Bensley said in a statement, which did not congratulate Kaufman. In a nod to the sensitivity of the situation, the state's other Democratic senator, Tom Carper, lauded the Kaufman pick while also acknowledging Carney. Republican Rep. Mike Castle, who has often been mentioned as a possible Senate candidate in the small state, praised Kaufman. Other Republicans were hopeful that the bad blood could lead to a tough and divisive Democratic Senate primary in 2010. “I’ve talked to a number of people today who are upset and think Carney should have got the appointment,” said state Republican Party spokesman Seth Wimer.